Family tries to revive search for Sala plane pilot | Daily Express Online, Sabah, Malaysia. LONDON: The family of the pilot of the small plane that crashed over the Channel while flying Argentine footballer Emiliano Sala to Britain has launched a fundraising campaign to find his remains. British rescuers on Thursday formally identified the one body pulled from the submerged wreckage as that of the 28-year-old striker. But strong currents and winter weather forced them to call off the search before locating 59-year-old pilot David Ibbotson, the only other person on the Piper Malibu propeller aircraft. “As a family we are relying on the kindness of the good hearted people to help us raise the much needed funds to help us find our beloved Dad, Husband and Son,” the GoFundMe page said. The campaign had raised around £25,000 by Saturday morning, a fraction of its stated goal of £300,000 ($390,000). 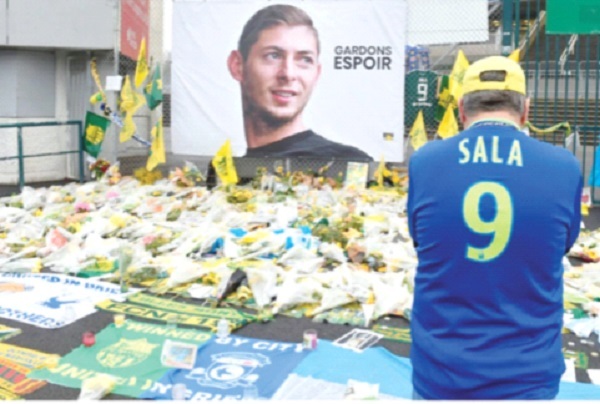 The plane carrying Sala from the French city of Nantes to his new English Premier League club Cardiff City disappeared near the British island of Guernsey on January 21. The Welsh club hoped Sala would would help them avoid relegation from the world’s most lucrative league this season after signing him from Nantes for a club record fee. The city of 335,000 has been in mourning for more than two weeks. Fans transformed the grounds around the stadium on Friday into a sea of bouquets and yellow-and-blue team scarves and jerseys in tribute to their fallen star. Cardiff City owner Vincent Tan said on Friday that the club have offered to pay to take Sala “back to rest” in his hometown of Progreso in rural Argentina. “We’ve offered to arrange to take Emiliano back to rest with his family in Argentina,” Tan told talkSPORT radio. Sala’s family said on Friday that his body’s recovery and identification could help bring closure to “the most painful time of our life”.